So, now that we’ve actually committed to giving the guest bathroom a makeover this summer, it’s time to come up with a plan. I have to be honest. When it comes to clients, this is my favorite part. Search for inspirational images, find a jumping off point, layer in all the pieces. But, for my own house, coming up with the plan where I really struggle. First, I went to my bathrooms Pinterest board. It’s one of my more developed boards because I have designed many bathrooms and am always looking for new ways to get creative with space and materials. I looked carefully at all of the images and evaluated them on two criteria – if the style resonated with me or not and if they seemed like they had good ideas I could use in our space. The reality of the situation is that the room isn’t perfect, nor is it going to be. It has a lot of little quirks and flaws, which are most apparent in the cabinetry and built-ins and soon-to-be-painted tile. Adding a lot of shiny newness will only make these older well-worn elements look even worse. Kind of like when I advise people not to put brand new granite or quartz on top of forty year old cabinets. I love so many things about this image above from The Lettered Cottage. The Hygge and West wallpaper is a long time obsession. 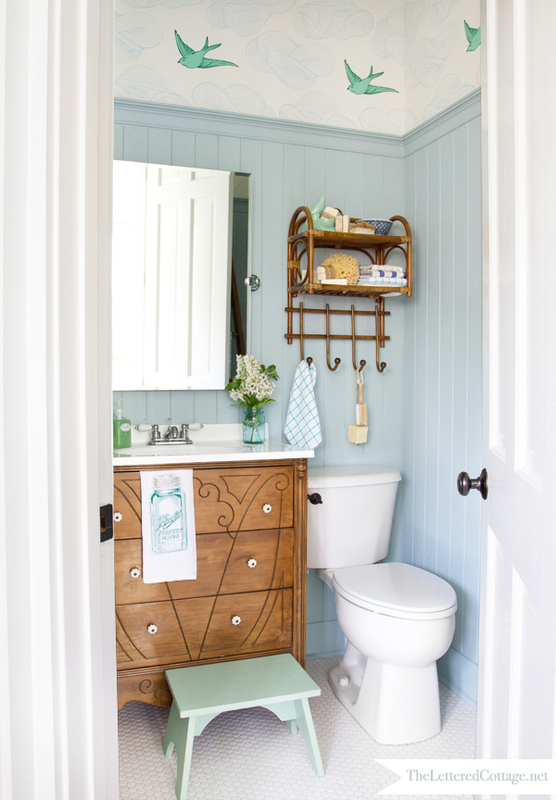 I think they did such a nice job of pulling the color palette from the paper, and the blues and greens look amazing combined with the wooden dresser turned vanity. If I were starting from scratch, I would definitely be adding a picture rail and wainscot along with penny round or hex tile. A palette of blue-greens and greens layered with plenty of white and wooden accents. I wish our bathroom had natural lighting like this room above so that I could bring in some greenery. I like the combination of finishes in this bathroom – the old, painted cabinets with brass knobs paired with the modern medicine cabinet and chrome faucets and towel rack. 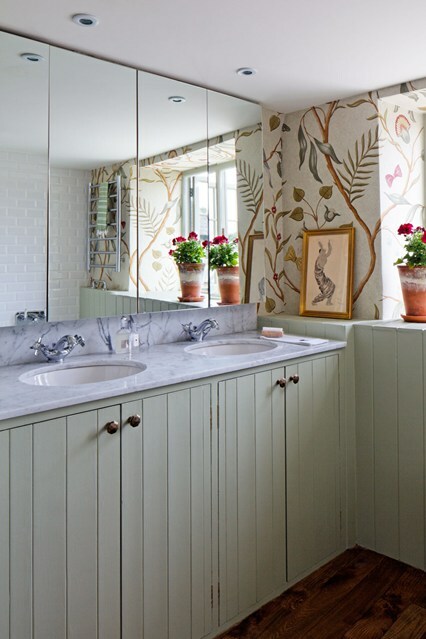 I love that botanical wallpaper and all of the color and pattern it adds to the space. Thin marble countertops (ours would be marble looking). 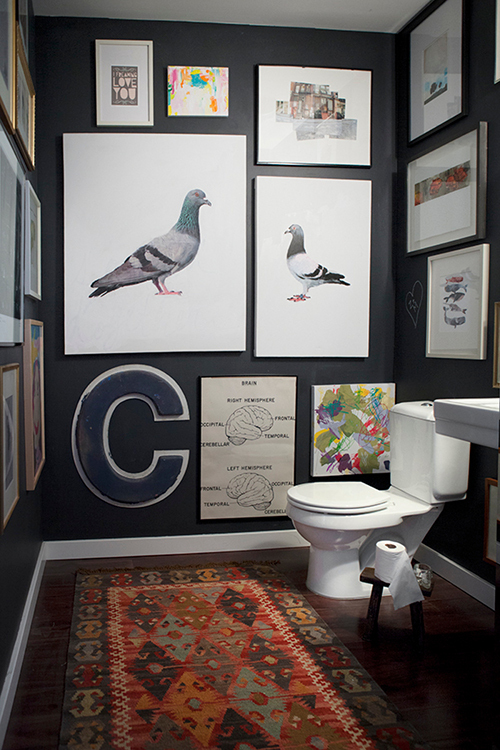 This dark bathroom is completely different from the other two, but I really like the idea of using an interesting rug instead of a bathmat, though I’m not sure if it’s practical. I think it would be fun to create a gallery on one wall, but maybe using all Instragram photos or a large Instagram poster? 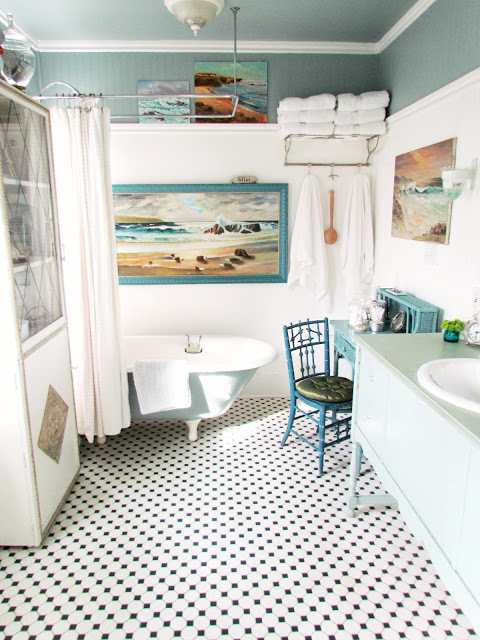 This bathroom is by Trisha Brink, and it has a similar color palette to the one from The Lettered Cottage. I think my favorite elements in this room are the landscape paintings, especially the one with the painted frame. Mostly white floor with black accents. Using one particular style of art to create a gallery. Paint the frames fun colors. Add a train rack for practical storage. My next step is to find a starting point for the design. I am almost certain that I am going to select a new shower curtain and use it to inspire the color palette. Right now, the curtain is purely for decorative purposes and to keep the ugly shower doors hidden when we don’t have overnight guests. I’m considering removing the doors, which is a little scary. Next time, I’ll share my concept board with selections and a rough estimate of the budget.